I am really surprised by how many people I’ve spoken to lately who spend their working life attending marvelously unproductive meetings. At first I thought I was alone in my frustration; there have been so many times I’ve walked out of a meeting wishing I’d spent my time in a more productive way. It turns out this problem runs across almost all industries and all levels of staff. So my team have been tasked to trial a social experiment of sorts, and if you suffer this same issue in your workplace, I’m inviting you to participate. 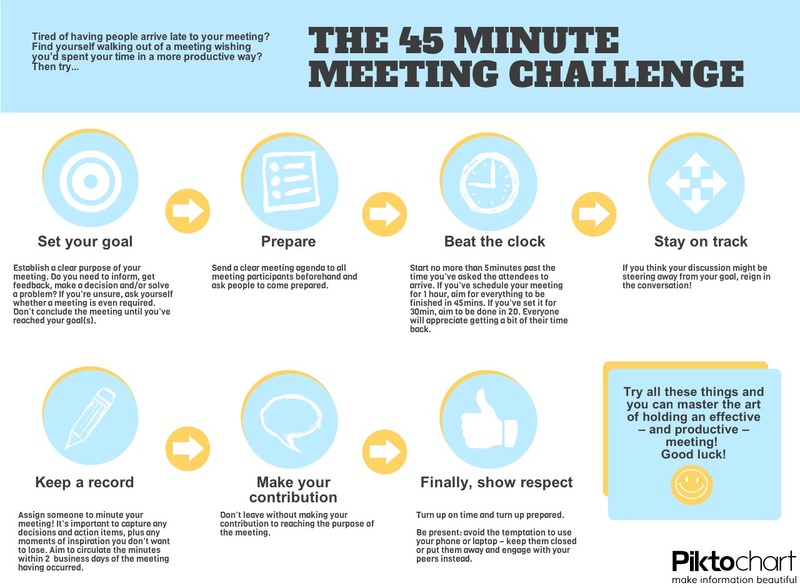 The 45-minute meeting challenge is quite simple really: book a meeting with a clear goal, turn up prepared, make a contribution, and aim to close the meeting in less time than it was booked for – be it 45 minutes or 20. It appears that a lot of people forget (or were never taught?) the basics of meeting etiquette, so here they are in info-graphic format. You are welcome to print this out and stick it in every meeting room in your office. Here’s to a more productive work day!